CFCA is the only major U.S.-based sponsorship organization to sponsor the elderly. Through our Hope for a Family sponsorship program, aging friends receive benefits that focus on providing better nutrition, access to health care, adequate housing and social activities. 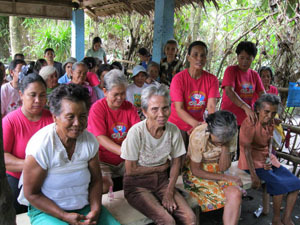 Some sponsored aging friends also participate in skills training or income-generating workshops. Most importantly, they are welcomed into a caring community and feel less alone. For some sponsored aging friends, CFCA meetings and events may be the only human socialization time they experience all week, or sometimes, all month. 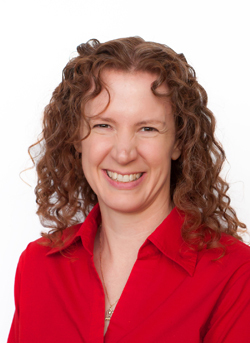 Michelle Dawson works in sponsorship operations at our office in Kansas City. Michelle sponsors five aging friends in the Hope for a Family program. She shares with us some of the reasons why she decided to sponsor an aging friend and why she loves it. How did you decide between sponsoring a child or an aging person? I heard a priest speak at my parish many years ago, but instead of sponsoring that day, I took a brochure home with me and called CFCA not too long after that. 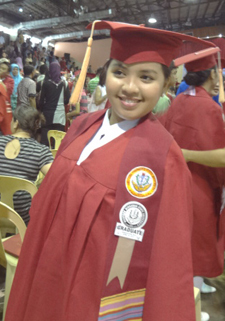 Xarina, CFCA scholar and one of the teens featured in the CFCA documentary film, ‘Rise and Dream,’ graduates from nursing school in the Philippines. In this season of graduations and young adults entering a new chapter of their lives, we have a very special graduation story to share with you! Xarina, one of the CFCA scholars featured in our “Rise and Dream” documentary film, graduated this May with a bachelor’s degree in nursing. “When I received my diploma, I was very happy,” Xarina said. Xarina learned to play the kulintangan and other traditional Filipino instruments as part of her training for the concert in Zamboanga. The “Rise and Dream” film follows the story of 13 teens living in poverty in the Philippines, who embark on a journey to discover their heritage and perform in a once-in-a-lifetime concert for their community. We touched base briefly with Xarina in August 2010, when she answered a few of our questions for her about nursing school and the challenges she had faced there. Her story, as well as the stories of 12 other teenagers, is featured in the “Rise and Dream” film. 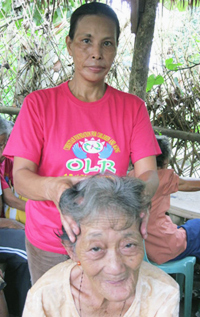 Mothers of sponsored children in the Philippines give massage therapy to sponsored elderly friends. The saying “scratch my back and I’ll scratch yours” comes to mind as many mothers of CFCA sponsored children and youth in the Philippines have found a new way to earn income. In a CFCA community in the Legazpi project, mothers train to learn massage therapy, and in turn provide their services to sponsored elderly friends. Staff members and individuals belonging to a CFCA livelihood group suggested the idea of giving massage therapy to the elderly to apply the knowledge they learned from the training. The program has accompanied success for these mothers around the area. Aster, mother of sponsored child Rose Ann, gives a head massage to Eufersina, who is also sponsored. Sessions occur at least once a month and have already served 50 sponsored elderly. The training helps provide more income to many mothers of sponsored children. “The money I get from my customer is of big help because it is one of my sources in my children’s allowances and projects in school. I also have a chance to give my children delicious foods,” Aster said. In addition to training, CFCA also helps the mothers make herbal massage oil used in therapy sessions. Some of the mothers’ first customers post-training were the children, but as they continue in practice, the sponsored elderly have seen positive results. 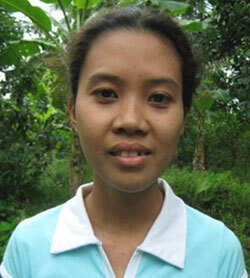 One sponsored elderly, Ignacia, acknowledges the notable differences the massages have made in her life. “When I experienced massage therapy from the trained mothers, my pains were lessened and I’m now able to perform the daily functions at home much easier,” she said. 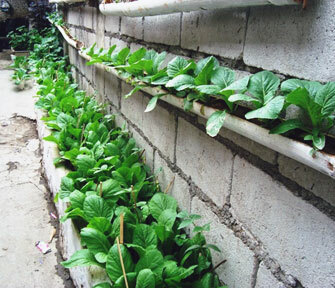 Chinese cabbage grows in bamboo strips in a CFCA organic gardening initiative in the Philippines. Rapid urbanization has brought many problems, including garbage, malnutrition, poverty and food insecurity. CFCA helps secure food for sponsored friends and their families while encouraging them to develop creative, sustainable solutions. Mavic Ihap, Quezon project coordinator in the Philippines, describes how parents of sponsored children are cultivating vegetable gardens in a Caloocan City neighborhood. As the CFCA project encourages families to act on their own development, our parents of sponsored children initiated a food security project, believing that cultivating their own crops is a better way of securing food for their families. One of the identified issues in their community is rapid urbanization. In the city people can seldom obtain fresh vegetables because most of it comes from distant provinces, which contributes to its high cost. Parents of CFCA sponsored children in their communal garden. Through their regular small-group meetings, parents eventually came up with the idea of vegetable gardening. They coordinated with the city’s agriculture unit for free seedlings when they started the project in January 2011. Beyond saving time and money, they can now provide their families a delicious and nutritious menu from the fresh vegetables just outside their doorsteps. For households with no space to plant, they used bamboo strips, plastic containers, tin cans, old pots and rice sacks. The gardens are a way of advocating environmental awareness within the community. They help “green” the city and reduce air pollution. It can also reduce garbage as they recycle non-biodegradable containers, kitchen scraps and anything that decays, which can serve as organic fertilizer. 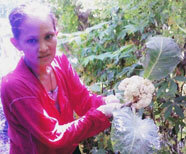 Jenny, mother of CFCA sponsored children Shailyn and Shaira, harvests cauliflower. Aside from household vegetable gardens, the project also includes communal gardening. Extra produce from the communal vegetable garden is sold around the neighborhood, helping replenish the group’s fund. This is a result of the project’s continuous community empowerment as we journey toward realizing the Hope for a Family program values. This initiative formed as a result of CFCA PamBuhay groups, where parents of sponsored children work together to identify and resolve important issues in their communities. You can learn more about PamBuhays in this story. I have always been a simple and quiet girl. I usually sat right in front of my teacher during class discussions, not because I am a ìstarî pupil but because I am different. I conversed with others believing that it was a calm, low voice I hear but in reality they are shouting at me, for me to hear and understand them. … Itís because I have a hearing problem. At the age of 7, it was not a question of finding a solution to my hearing problem. My family, friends and teachers showed enough sympathy and support, except for those who would choose to make my day miserable rather than study lessons. They would play and laugh with me and then publicly show to me their whispering sessions, emphasizing that it was impossible for me to hear them. I would usually go to one corner, where only very few pass by, sit with my knees drawn up close to my body and my face tucked between my drawn knees and chest, and cry my heart out at the cruelty of others. I would usually give myself a minute or two to compose myself, a big pat on the back to boost my depleted morale and then go back to my assigned seat in class and forget as best as I could what had just happened. In high school, I remained the ìdifferent one.î People conversed with me like normal but sometimes, I saw their silent laughs and pitying looks when they turned their backs from me. Well, I was used to it. It was like an ordinary thing for me. I was in high school when I became a CFCA beneficiary. My sponsors are Mr. Rich and Sarah Deien. From the start this generous couple had never failed to support me. I have received so many beneficial things that I will be forever thankful. They wrote letters to me and I wrote back. With this, they donít have to shout for me to hear. I easily understood what they wanted to tell me. It felt so normal. Project staff and Unbound families in the Antipolo project respond to the call to care for our Mother Earth by caring for our local environment through a program we call Clean and Green. Clean and Green enhances Unbound sponsorship for our sponsored individuals and their families. The Antipolo project uses ongoing training, lectures and discussion to incorporate Clean and Green into spirituality and way of life and to encourage families to consider the ecosystem. As Unbound farming families learn irrigation methods for rice paddies and corn growing, more and more are gradually shifting away from the kaingin (slash and burn) way of farming. The families in urban areas promote waste management by reducing, reusing and recycling. To reinforce this practice, we do not use disposable cups, plates or utensils; plastic wrappers; straws; and Styrofoam during our activities. 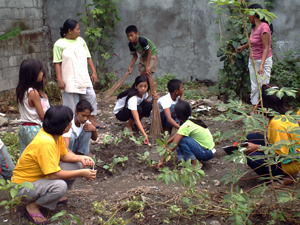 Our sponsored children, youth, their parents and the aging in kapitbahayans (small, caring communities) devote one to two hours every Saturday morning to cleaning up their surroundings, streets, canals and rivers. This contributes to disaster risk reduction. 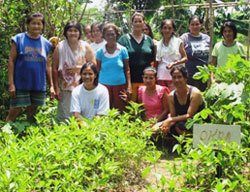 Kapitbahayans grow plants and flowers in easement lots and open spaces to improve their communities. They cultivate these spaces for communal gardens of vegetables and medicinal plants. They can also share the harvest with neighbors. A tree-planting activity takes place yearly. Most families plant the seeds from the fruits they eat. Many sponsored aging friends love this activity. Though they say they may not witness the fruition of the trees they have planted, for them it is their gesture toward repaying the food they eat without the effort of growing it. We have planted and nurtured thousands of trees. The ages of these trees range from younger than one year to more than 10 years old. They are growing in backyards, along the roads, rivers, in the parks, open spaces, foothills, watershed and shores in the communities served by our three subprojects. Fifteen sponsored youth leaders with parent advisers are graduates of a comprehensive training on holistic environmental education. This training discussed inner- and outer-ecology, and cosmic ecology. They also learned about the making of bokashi balls (click here to read more about bokashi balls), an indigenous technology of effective micro-organisms that eliminates harmful bacteria from fresh waters. They facilitate the same training on weekends with the sponsored youth, children, mothers and fathers group leaders. The Earth Day celebration is one of the most important events of the year for us. This year, the families will celebrate Earth Day with a parade around the town or barangays (neighborhoods), and then they will watch a film and attend workshops on environmental concerns and climate change. 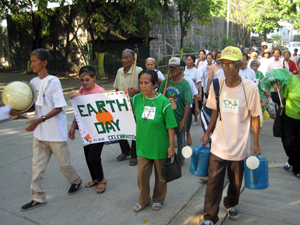 The fathers group, with Unbound families in the communities of Angono, will celebrate Earth Day with a parade around the town and will launch their commitment and initiatives to heal the dying Angono River. They made 14,000 bokashi balls to drop into the Angono River to help heal the river and its species. In our little way, we can radiate to each other, to the children, youth, aging and families, our dedication to care for the environment and our special love for Mother Earth. 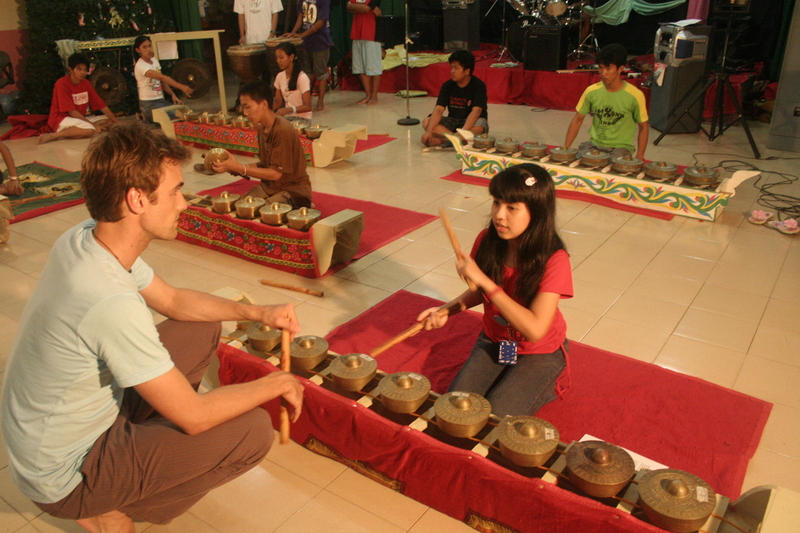 Xarina (foreground) and other CFCA scholar students learned and performed on traditional Filipino instruments for a concert in the jungle surrounding Zamboanga City, Philippines, in January 2008. The concert will be featured in ZAMBOANGA, a documentary film. Visit www.zamboangathemovie.com for more information. Scholarship students from the Philippines formed a special bond while studying traditional Filipino instruments such as the kulintangan, the dabakan and the agong. 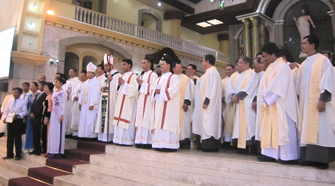 The students rehearsed throughout the year for a CFCA concert on Jan. 30 in Zamboanga on the island of Mindanao. The experience awakened an interest in composing and writing for scholar Xarina, 16. Xarina is featured in the Spring/Summer issue of The Scholar, a CFCA publication that highlights the accomplishments and challenges of students in the CFCA Scholarship Program. Hours of rehearsal put a strain on Xarinaís studies, but the hard work paid off. ìThey did brilliantly,î said Kansas City-based musician Barclay Martin. Martin arranged the concert music and wrote original songs combining traditional Filipino and modern music. The day after the concert was bittersweet for the students, Martin said.